A well executed war movie can be one of the most thrilling, memorable experiences you can have in a cinema. War is custom suited for the silver screen; it’s an environment loaded with heightened emotion and explosive action. 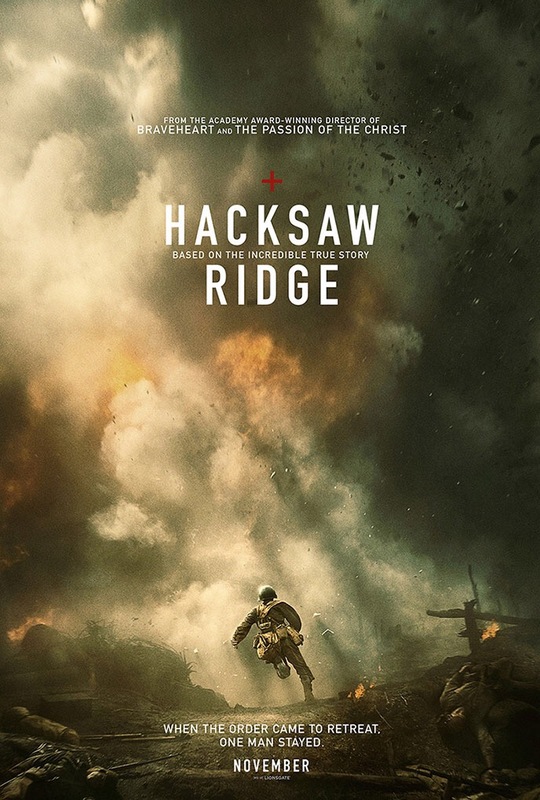 And while Hacksaw Ridge has both of the latter traits, the emotion is too maudlin, and the action too overwhelmingly visceral to truly place itself in the category of great war films. The cast was clearly chosen for their almost Disney-esque features. The lead, Andrew Garfield, wields his doe-eyed innocence well as the noble lead, Desmond Doss. The remaining cast rounds out a group of well worn cinematic clichés: Hugo Weaving as the stubborn, alcoholic father; Rachel Griffith as the doting, loving mother, and Vince Vaughan as the loud mouth drill sergeant. The film’s first half is overwhelmingly melodramatic. It detail’s Doss’s life, and what has lead to him becoming a conscientious objector – he refuses to wield a weapon in battle – that has curiously enlisted in the army. Mel Gibson has previously shown that his work can be cheesy – Braveheart had moments that were amusingly broad and emotional – but Hacksaw Ridge’ s opening act is baffling in its sickly sweet sentimentality. The film’s second half is essentially non-stop action. It detail’s Doss’s heroics on the titular ridge as he saves dozens of wounded soldiers. Gibson has always had a great knack for action directing. The battle scenes in Braveheart were unforgettable, and Apocalypto had bracing, effective violence that seared itself onto the viewer’s consciousness. While Hacksaw Ridge has generous heapings of action and violence, it is delivered in such a wild-eyed, brutal way that is feels more wacky than effective. It feels like Tarantino level hyper-violence, rather than realistic, wartime carnage. These two distinct chapters make the film shockingly uneven, which is surprising given Gibson’s pedigree. While his previous films have been imperfect, they were always competently told, and satisfying to watch. Hacksaw Ridge covers an admirable story, and admittedly has moments of decent visual flair, but overall its first half is distractingly emotional, with a gore filled climax that feels both unearned and inappropriate.